ZANZIBAR NI KWETU: Canada to ask allies to help cool Saudi dispute; U.S. offers no aid! 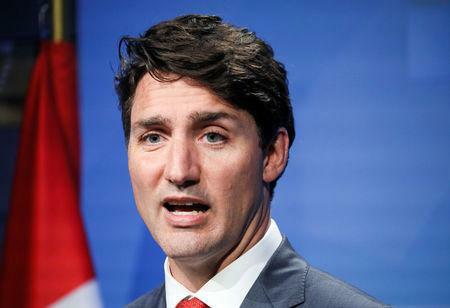 Canada to ask allies to help cool Saudi dispute; U.S. offers no aid! The United States, traditionally one of Canada's most important friends, stayed on the sidelines. U.S. President Donald Trump - who criticized Trudeau after a Group of Seven summit in June - has forged tighter ties with Riyadh. The dispute looks set to damage what is a modest bilateral trade relationship worth nearly $4 billion (£3.09 billion) a year. Canadian exports to Saudi Arabia totalled about $1.12 billion in 2017, or 0.2 percent of the total value of Canadian exports. Canada says it does not know what will happen to a $13 billion defence contract to sell Canadian-made General Dynamics Corp armoured vehicles to Saudi Arabia. Thomas Juneau, an assistant professor and Middle East expert at the University of Ottawa, said Saudi irritation at the way the General Dynamics contract was handled also helped explain Riyadh's response. The first Canadian source said Ottawa had no regrets about speaking out on human rights in Saudi Arabia. Canada's ambassador, Dennis Horak, is not in Riyadh. The source said Saudi authorities were aware Horak was due to start a new posting next month.